Money received from different enterprises or activities in which a person is not actively involved and also requiring minimum to no endeavors to make money is known as passive income. There are a lot of passive income ideas where some require tiny work to earn such as managing a gadget blog to write product reviews in order to earn via affiliate marketing and some of them don’t require any work just like investing your money via investment apps. Earning passive income is the most favorite way to generate more money in these days as it doesn’t eat up a lot of precious time and energy as well. However, passive income may not be able to replace your monthly salary but can add up some more pennies in it boost personal finances. Below are some realistic passive income ideas that can help you earn more even without spending a lot of efforts and time. P2P lending is also known as peer 2 peer lending is one of the great passive income ideas to make money from your extra money or savings. In this process, you can offer short-term loans to different people in your social circle like friends or family members who don’t qualify for bank loans. You can choose the borrower of your own choice in order to alleviate the risk of non-payment in future. You will just need to find a borrower who is ready to pay you the interest with the principal amount that you want on a specific date and will get the money back on the mentioned date along with communicated interest rate. But, always remember to sign the money lending agreement with the other party in order to prevent troubles in days to come. If you have a Facebook page with millions of fans or a personal blog with huge monthly visitors, then you can turn them into earning machine by starting online advertising. You can place Facebook ads for clients to make money or can offer paid guest posts on your blog in order to earn $$$. You can also monetize your blog with different advertising companies like Google AdSense so they will place their ads on your blog or website and then pay you back for the clicks on advertisements. 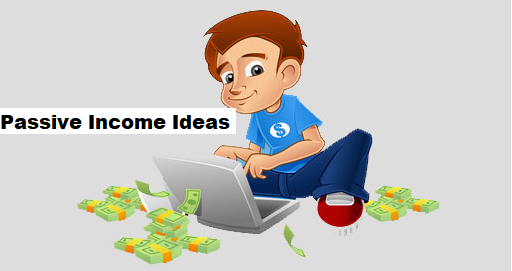 It could be the best passive income idea for a blogger or web designer. As a blog owner, you can double your passive income via affiliate marketing. Yes, it is all about selling products of a company on your blog as an affiliate marketer in order to get some advertising fee or commission back from the primary seller. Affiliate marketing is a most common way to earn money online but you must check all the things to consider before joining an affiliate program. You can save a big amount of money by paying your debts off quickly. It is one of the perfect passive income ideas as it requires no effort and time but effective planning to pay the debt as soon as possible. You can easily do it by making monthly payments more than the calculations. In this way, you will be able to save money in terms of reduced or no interest rate by paying the debts before the due date. By doing so, you can increase your passive incomes amazingly to have more funds and savings on hand. Opening a saving account that offers you handsome monthly or yearly interest rate is one of the best passive incomes ideas to keep your money save as well as to generate more money from it. Once your money saved in a selected savings account, there is nothing more to do and you will start making money from the balance available in your account. Nowadays, interest rates are rising due to the competition in banking field and putting more money into the savings account could be the best way to boost your passive income without going elsewhere. Renting out an extra room in your house or an extra building is one of the most famous passive income ideas to generate more money from extra or useless property. You can consult with a local real estate agent to find the best tenant but if you also want to save the commission out to be paid to the agent, simply design an appealing ‘Room for rent’ or ‘building for rent’ poster and place on the gate. You can also advertise the room rental opportunity on Facebook to get better outcomes even in short span of time. You can convert your hobby of photography into earning by selling stock photos on famous websites like Etsy and Shutterstock etc. Professional bloggers and web developers usually get quality graphics from stock photos sites in order to lessen their efforts. And you can also sell your creatively captured photos on the internet to earn some bucks in return. All you will need to create an account on best paying stock photos site and submit your photos there. This passive income idea can work great for passionate photographers to double their monthly incomes. As most of the businesses always need finances to run and manage their business operations effectively, you can boost your passive income by investing a business as an angel investor. Just find a business that cannot get a loan from the bank or financial institution due to some reasons and offer your money to fund the business needs in order to get some $$$ back with the investing amount. Since it is one of the realistic passive income ideas, you should remember to sign an investment agreement with the business owner or company to ensure that your money is in safe hands and there is nothing to be worried about.